Oklahoma's offense is incredible and they are going to score on us. Let's just get that out of the way now. However, the argument that they haven't played any defense worth a damn is also extremely accurate. S&P+, which filters out all the normal "reasons" why a BXII defense really isn't as bad as the normal stats say, confirms this point. Now, as my follow up will show, our offense has a very similar downward slope when we play elite defenses. The difference is, we won't be playing a Top 20 defense........we'll be playing one of those defenses down in the bottom chart. 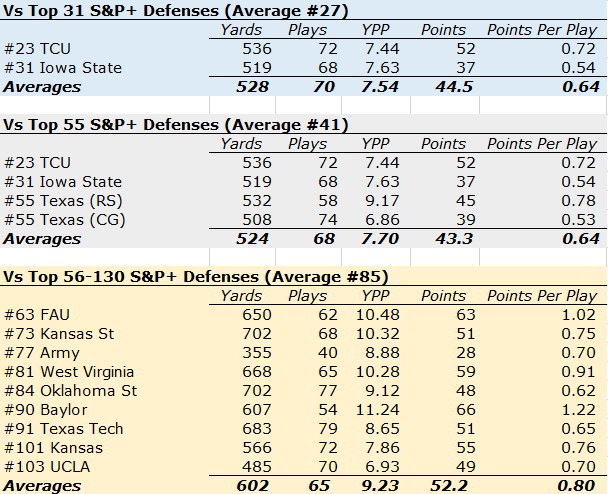 Oklahoma will be playing a defense in the top chart (and one that has been better and has better athletes and football players at every level than TCU, Iowa State or Texas). I'm hoping that they can't get anything going on the ground early and just give up trying. Kyler is great, but if he's dropping back every single play and everyone knows it, bad things are gonna happen eventually. Picks, strip sacks, etc. When I was watching the Texas game I couldn't believe how much time he had to sit in the pocket, it was incredible. I'm not expecting that to be the case again. As for his running, it's time for Moses to show why he was getting scholarship offers fresh out of the womb. Here is our chart. 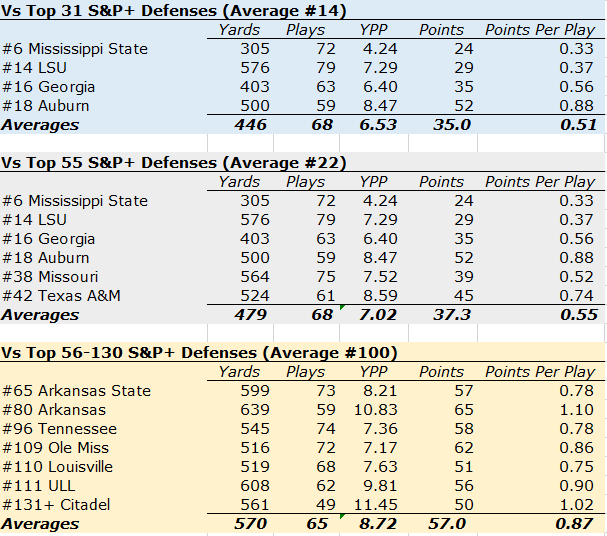 Oklahoma is currently #89 in S&P+ defense, so right between Arkansas and Tennessee. So you're saying we will win 57-44? OU is also something like next to last (out of ever team in the FBS!) in red zone defense and 4 spots from last place in passing yards allowed. (last time I checked the numbers was before the TX game, though). I mean, that's horrendous. Imagine what Bama could do to any team that's essentially the worst in the FBS at a certain aspect of the game (especially a super important aspect like red zone defense or passing yards allowed). Against similar defenses our two offenses have performed basically the same - with us a little better. We had 500+ yards in every game but 2 and 400+ yards in every game except the one against the #6 defense. What is Bama's S&P+ rating on D? Top 5 IIRC. 8th - which seems about right to me. Very good, but not elite. #8 is fine considering that Saban took his foot off the gas and played a ton of backups. It's hard to come up with any mathematical model that can correctly assess yards given up in "garbage time*. The very definition varies widely. Plus some years you can afford to leave your starters in while in other years your backups need to play to provide depth. I will say that this year's rating on D no doubt exceeded everyone's expectations. They are 128 out of 129 in passing defense. They are .3 yards per passing play better than Houston and give up the most yards per game passing in the CFB. That said, it looks like the best case scenario for the Bama D is to give up approximately .55-.65 points per play... that is a scary freakin' proposition. If our offense stalls at all, we are going to be in trouble fast. Turnovers will have a bigger effect on this game than they usually would. Yea, this game is going to be a nightmare. I feel pretty confident we win........I also feel pretty confident I have like 4 heart attacks. I also feel pretty confident I have like 4 heart attacks. Only 4? Lucky man. Every time Murray passes the ball I'm going to have a little heart attack. I just really hope we come out clicking early, get a stop or two, and build a little lead. I'll be nervous holding it, but not nearly as nervous as if we go all A&M 2013 and fall behind 14-0 after 5 minutes. Murray usually has a ton of time to pass, it is like no one blitzes him. Bama has to keep him contained, but also bring pressure.